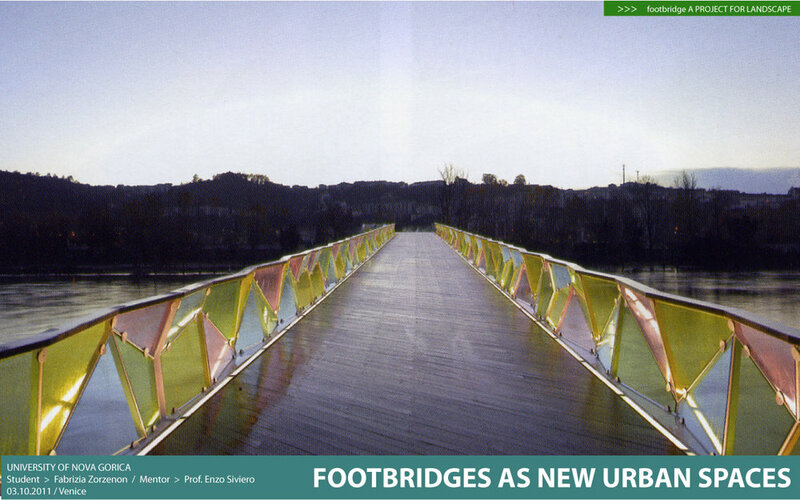 For almost thirty years now footbridge design has been acquiring the worth and importance which for a long time has been characteristic of architectural works. For most of the twentieth century , the quality of a bridge was judged only on the basis of its size and length. 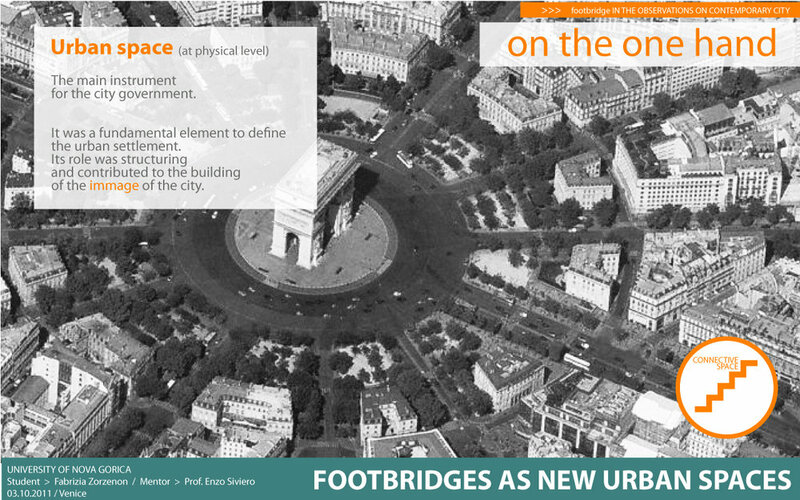 This view gave footbridges such secondary importance that they were often reduced to simple structures with beams. 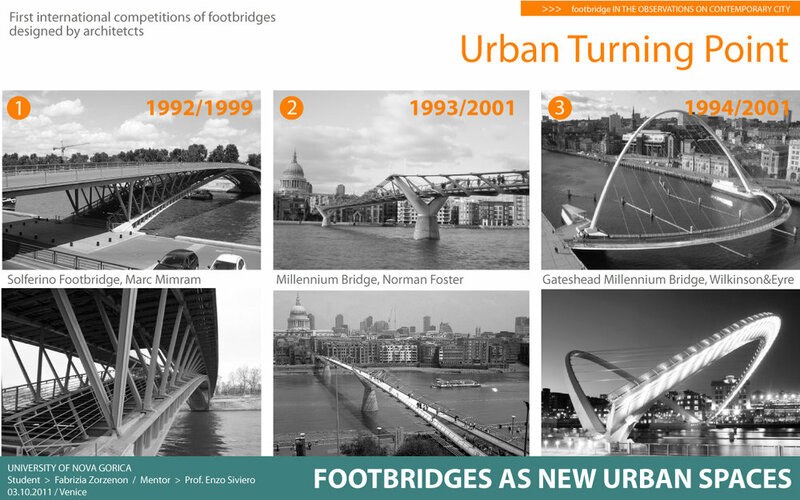 However, at the turn of the new millennium, a radical change of thinking caused the footbridge to be rediscovered as a “vessel of metaphors”. 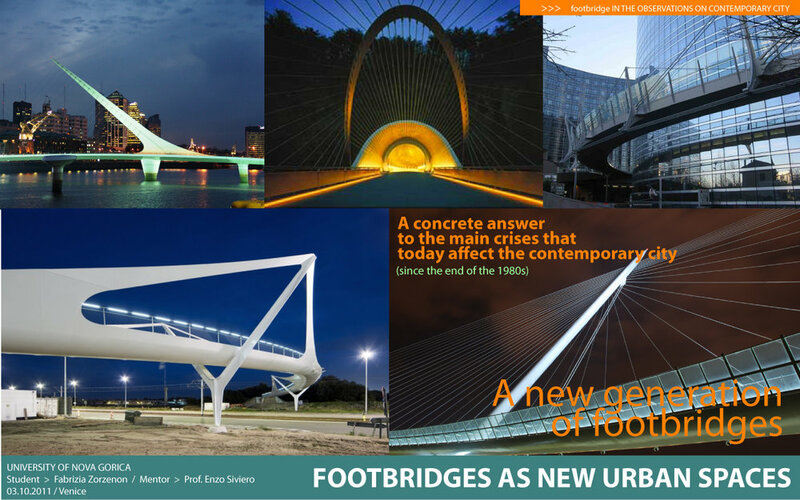 Starting with authors like Calatrava, Mimram and Schlaich, at the beginning of the 1990s, an increasing number of architects and new design engineers began to see the potential behind the design of these structures so that in a short time a new generation of pedestrian bridges was born. So different from what had gone before, these structures embody the cultural revolution that in little more than twenty years has managed to profoundly change not only their day to day use, but the actual image we have of them today, both in terms of form and importance. 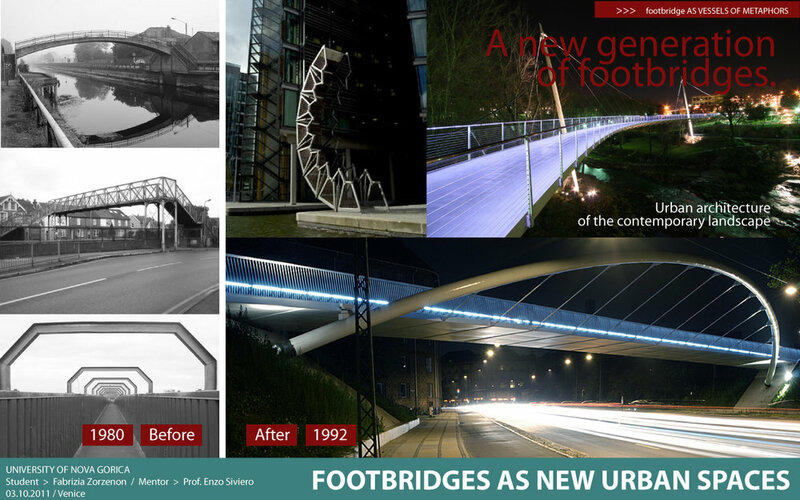 Today, the footbridge has changed from being a simple, anonymous structure whose sole use is to clear an obstacle, to being just like any other work of architecture, something which by its very form and presence contributes to the landscape we live in. It thus acquires the importance of landscape architecture which enables it to give form to new and unexpected experiences of life, to new and unexpected places for cultural Exchange and meeting. The reasons for this unexpected transformation did not occur by chance or because of some fad. 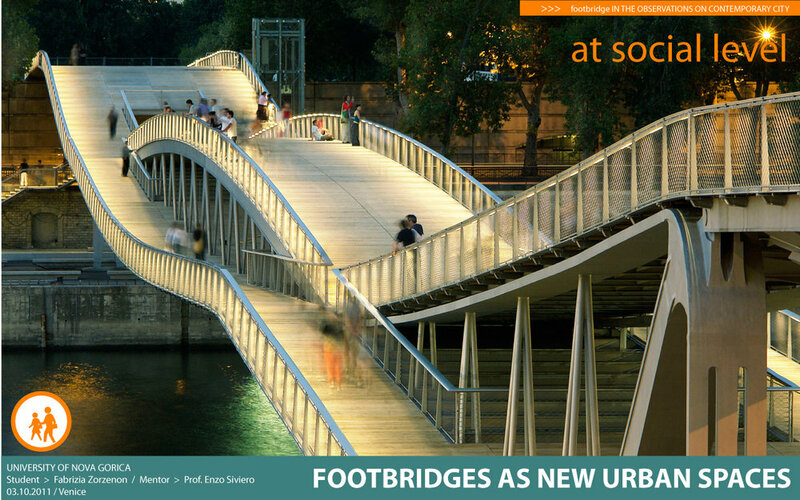 They can be found in the way that the great European cities have addressed the ecological, social and urban crises which they have been facing for decades. 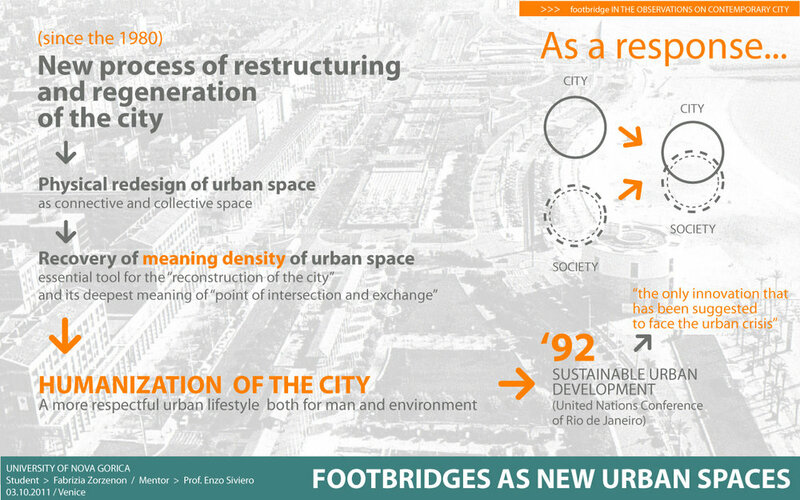 On an urban level, one response to the problems started a long period of design which, beginning with Bohigas’ plan for Barcelona (1988-1992) has seen important urban re generation in Europe, starting with the re design and reorganization of roads and squares, in fact, of all open and public spaces which are a substantial part of urban construction. These are plans whose aim could be summed up in the commonly held desire to bring the city back to its original importance as a meeting place par excellence, a place where, by interacting with others, the individual can find himself, his nature as a social being and his integral part in a wider system called society. This is a feeling that the widespread use of cars has gradually worn away over the years. Reconstructing a city starting with urban spaces means reconsidering its entire infrastructure in ways above and beyond purely financial and technical issues which until the 1970s had been the sole concerns of every project. 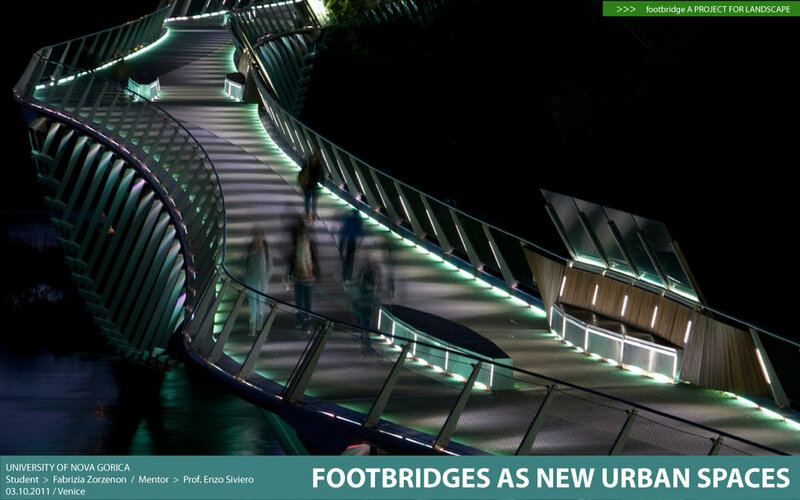 From here, a new design philosophy emerged, which, in a few years, has managed to transform the footbridge from a simple infrastructure design into a real urban design or rather a landscape design. 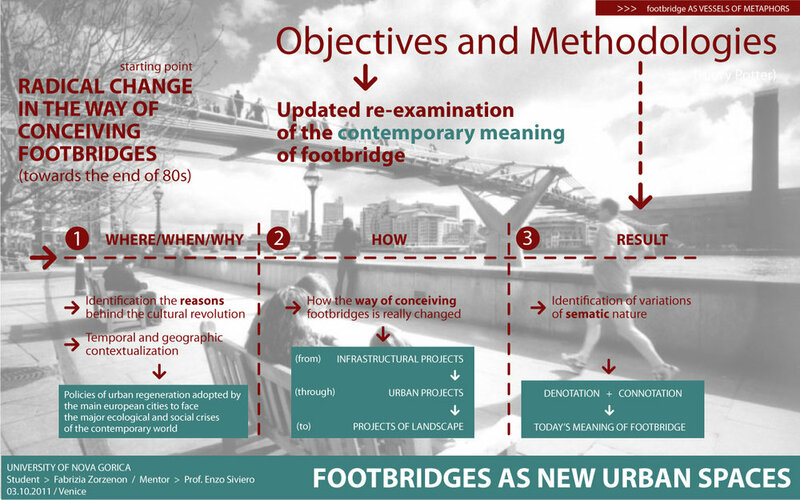 Footbridges, which are no more out of context now become structures that are morphologically integrated into the architecture of the landscape of which they are part. 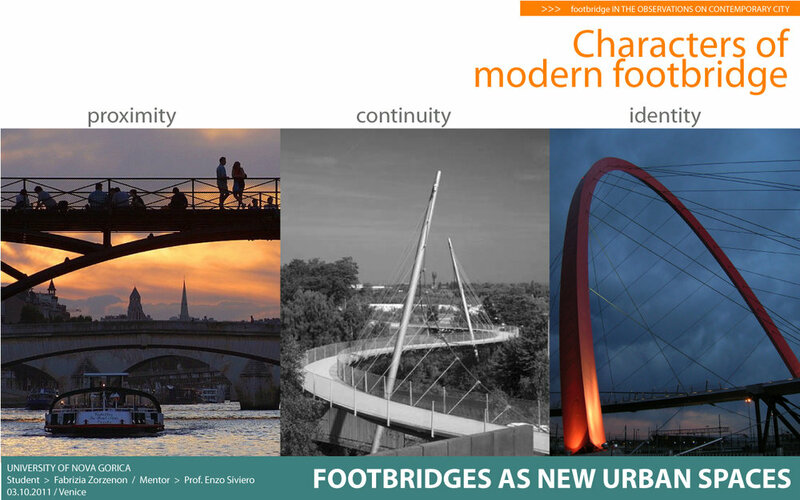 Bridges, which by their shape help to reassemble that nebula of fragments, typical of the contemporary condition, and create a continuous flow that twists and turns inside the urban fabric. Bridges which possess that regenerative potential present everywhere, which is conceived above all to be experienced and crossed by man. 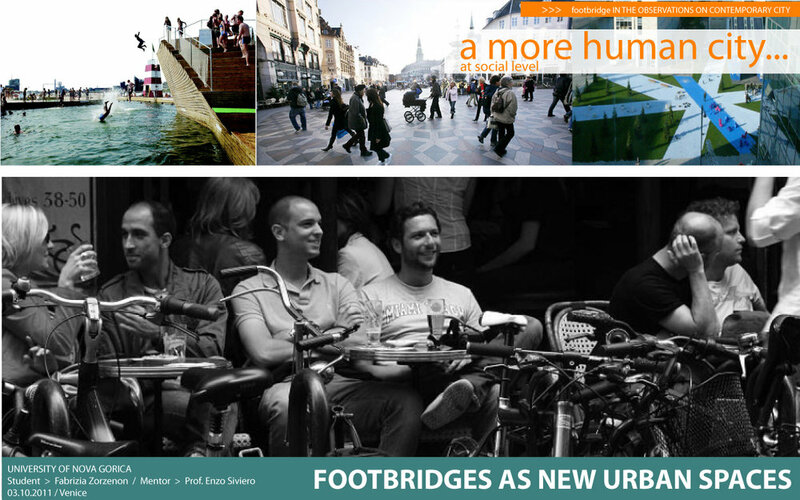 Footbridges that like rooms in the open, have the power to physically redesign the landscape and also have all the potential to become places of warmth, of social interaction, or rather spaces which can rebuild that synergy between humans and their land that makes every space into a place to be lived. A landscape design however, involves more. Crossing a footbridge is like crossing somewhere in slow motion. Its architecture, building materials and the details of its parapet create a friction that almost without our realizing it slows us down to a halt. It is right there, when we stop that we open our eyes and look around. Suddenly our attention is aroused. Like a sponge our senses absorb everything that surrounds us. Mind and body are realigned to the present and our perception of reality, usually superficial and volatile, returns to what it was originally, charged with meaning and full of feeling. The pedestrian bridge thus brings us back to reality, makes us realize how beautiful our surroundings are and what inexcusable damage man’s ignorance in the past has caused. Bridges encourage us to open up to the world, to live and rejoice in it and be in harmony with it, they encourage us to find ourselves again as part of everything. What the works in this book have in common is all of that. 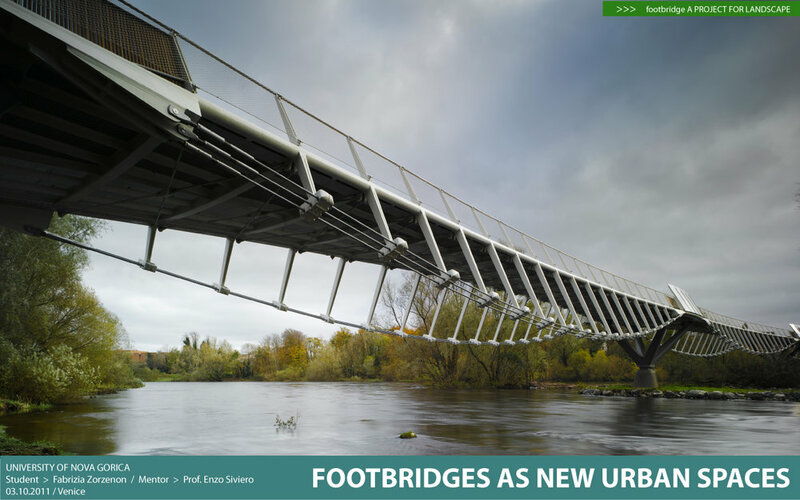 They are footbridges that do not simply go over obstacles or connect two opposite banks of a river. They are bridges that go well beyond that. They explain their nature fully by connecting, through their architecture, reality to more levels. 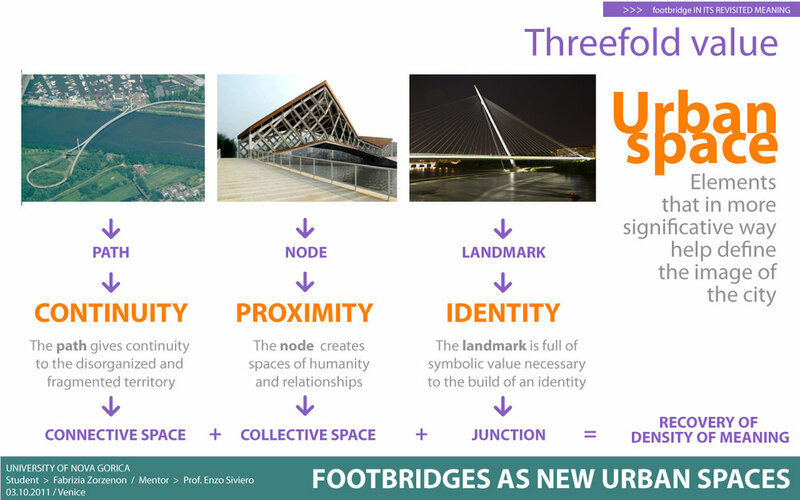 They are bridges that even with simple shapes speak a higher language that elevates us to commune with beauty.